What Does Code P0231 Mean? The internal combustion engine needs three basic things to start and run: air, fuel, and spark. With regards to this DTC (diagnostic trouble code), we’ll be focusing on fuel. The fuel system includes the fuel tank, a low-pressure fuel pump, sometimes a high-pressure fuel pump, fuel tubes and hoses, a fuel pressure regulator, and the fuel injectors. The fuel pump and fuel injectors are operated electrically and electronically, so there are also fuses, relays, and a controller for these. Usually, the controller is part of the ECM (engine control module), though some vehicles, such as some diesels, may have a separate fuel injector driver module. Usually, the fuel pump relay is commanded by the ECM. The ECM grounds the fuel pump relay control or primary circuit, which then feeds power to the fuel pump using the power or secondary circuit. On some vehicles, turning the key on will turn the pump, on for a few seconds, to prime the system. If the ECM detects crank but not engine starting, using the RPM signal from the crank position sensor, it will turn off the fuel pump after a set period. What are the common causes of code P0231 ? Depending on year, make, and model, DTC P0231 may have number of causes. Here are some of the most common. Relay – If the fuel pump relay is faulty, no voltage will go to the fuel pump or monitor. Harness Damage – If there is damage to the harness going to the fuel pump, it can cause excessive resistance (corrosion), an open circuit (broken wire), an intermittent open circuit (partly-broken wire), or a short to ground (contacting the body or chassis). Inertia Switch – The inertia switch opens the fuel pump circuit, in case of an accident, to prevent the fuel pump from possibly dumping fuel onto the vehicle and the ground. This is a fire-prevention measure. If the inertia switch has been activated, even by a small impact, it could interrupt power flow through the fuel pump and to the ECM monitor. What are the symptoms of code P0231 ? Depending on the nature of the fault and the failure mode, the MIL (malfunction indicator lamp) will illuminate, but you may or may not notice any drivability symptoms. The engine may not start, or start and then stall. Concurrent DTCs may include fuel system lean or misfire codes, if the fuel pump is not operating at full capacity. How do you troubleshoot code P0231 ? A circuit low voltage indicates there is a problem in the circuit, not necessarily in the sensor or actuator, in this case the fuel pump. Do not jump to replace anything unless it has been tested and found faulty. For example, replacing the fuel pump will not solve this problem unless the fuel pump is shorted internally. In this case, the ECM is expecting to see at least 10.5 V when the pump is commanded on, but isn’t. You’ll need a DMM (digital multimeter) and an EWD (electrical wiring diagram) to diagnose and repair this problem. Voltage Check – First, check that the battery has at least 12.6 V with the engine off and at least 13.5 V with the engine running. Correct any problems here before proceeding. Fuse Check – Check the fuel pump fuse. If the fuse is blown, this may indicate a short circuit somewhere in the system. Proceed with caution – simply replacing the fuse may result in another blown fuse until you repair the short circuit. Short Circuit Check – With the fuel pump relay removed, you should measure at least 4 Ω through the pump to ground. If you measure <4 Ω, you’ll have to find and repair the short circuit. Repeat the test with the fuel pump disconnected. If the short circuit persists, the short is somewhere between the relay and ground. Look for chafed wiring or poor aftermarket installations that may have caused the short-circuit. If you get an open circuit, >10 kΩ, the previous short circuit is in the pump. With the pump disconnected, measure resistance across the terminals. If you measure less than 4 Ω, replace the pump. Fuel Pump Relay Check – You can do this by swapping it with a known-good relay, such as for the wipers or headlights. Otherwise, you can bench-test it by powering the primary circuit and checking for resistance across the secondary circuit. If the relay swap works – you marked their original locations, right? – you can condemn the fuel pump relay. If the relay swap doesn’t work, put the relays back in their original positions. Relay Inputs and Outputs Check – Two terminals of the fuel pump relay should have power and two of them go to ground. Test for resistance to ground on the secondary (fuel pump) circuit, which should measure at least 4 Ω to 6 Ω. Go back to the short circuit section above. The primary circuit is grounded by the ECM, so you should check for ground when you turn the key to the “On” position or try to crank the engine. If you see no ground, check for an open circuit somewhere between the relay and the ECM. 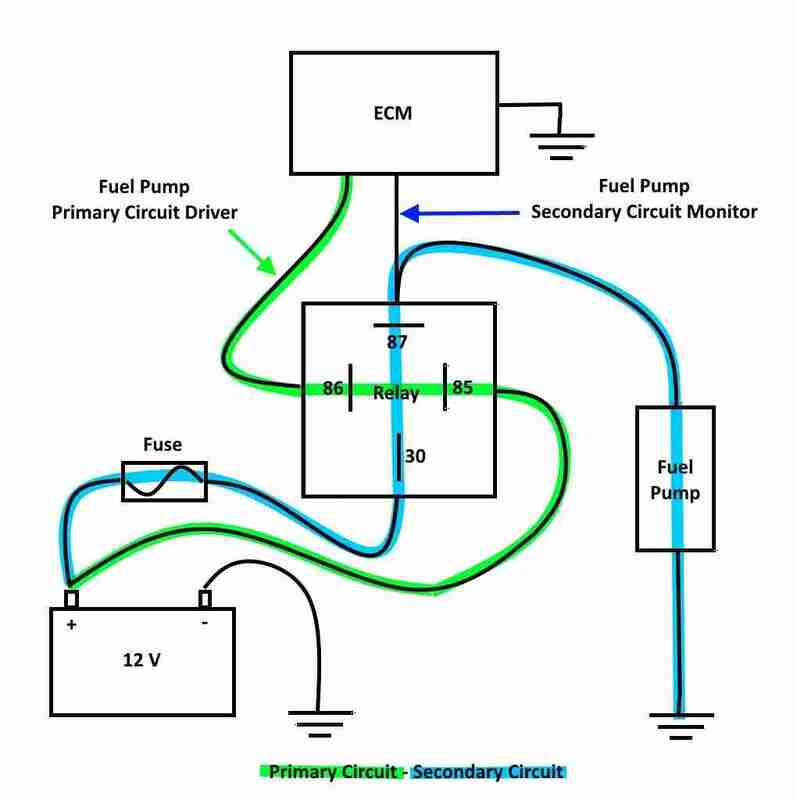 Fuel Pump Monitor Circuit – With the ECM disconnected, check for continuity from the fuel pump relay secondary circuit to the ECM. An open circuit or excessive resistance here will fool the ECM into thinking the fuel pump isn’t getting enough voltage. If you measure more than 0 Ω, check for broken wires or corrosion. Repair as needed. Usually, circuit low DTCs are caused by voltage problems. I would suspect corrosion or an internal relay problem. Check that you have at least 13 V on the alternator while running and at least 5 V reference from the ECM. Check connectors and wire harnesses for damage, particularly chafing or something could impede or bleed off voltage. Make sure connectors are free of water and corrosion.